Collective Architecture are delighted to announce that plans have been submitted to the London Borough of Sutton for a new mixed use development on the site of the now derelict Victoria House in North Cheam. 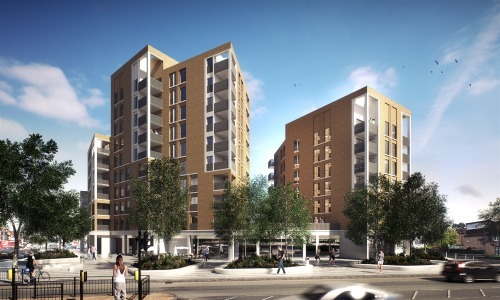 The proposals for Home Group will include the demolition of the former office and retail building to deliver 90 exemplar new homes for North Cheam located above new retail space and improved public realm. A mix of high quality, contemporary 1, 2 and 3 bed flats have been arranged within clearly defined blocks which rise from the existing building datum lines of nearby London Road and Church Hill Road. The transition with neighbouring residential and commercial buildings was developed to achieve identifiable connectivity around the site whilst creating a taller landmark building appropriate for its town centre gateway location. The material palette is deliberately restrained, and has been informed by the 1930’s architecture evident on the three opposite corners of the crossroads. Limited to facing brick and areas of precast concrete detailing around balconies and window openings, the intention is to create a high quality piece of contemporary architecture with an identity that makes reference to its context. Carefully orientated corner balconies offer views towards south west London and a shared residents garden offers a green outlook and place for social interaction to the rear of the building. The public realm improvements which form the frontage and setting to the development are being developed by LDA Design. The landscape concept for this space aims to develop a simple, functional design that improves the quality of the existing public realm and creates a safe, uncluttered environment for pedestrian movement and access to retail units. Victoria House is the first major residential scheme to be undertaken by Collective Architecture in London and follows the recently completed supported accommodation projects in Bells Lane, Preston and Aviary House, North Solihull, both of which were also completed for Home Group.